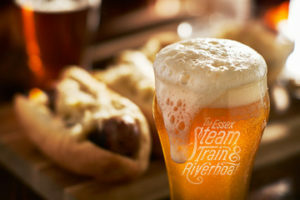 ESSEX — Enjoy ‘Brats & Beer’ along with beautiful fall foliage on the Connecticut River! A great night is in store for you from the minute you smell the brats sizzling on the grill to the last sip of beer as you glide into dock after the last rays of a stunning sunset. This unique evening on Thursday, Oct. 11, runs from 5:45 to 9 p.m. Arrive 5:30 p.m. in Essex for departure at 5:45 p.m. for a two-hour cruise on the Becky Thatcher Riverboat. Return to Essex at 9 p.m.
Visit EssexSteamTrain.com for tickets and more information.